Well done Nigel for some excellent results so far this season. Below are his race reports. A ‘virgin’ Virgin Money London marathoner. Having waited 6 years to get through the ballot this was always going to be a challenge to live up to expectations …. but it turned out to be the best run I have ever done, fantastic crowds , landmarks and support from the London crowds, was no one at home that day ????. The experience made the hairs stand up on the back of my neck and stay up !!. …. and when you think you are struggling at about 18 mile there nothing better to pick you up than seeing some guy passing you at about 11 mile carrying a bag of sand on his back and batman giving you a high five as he passes you L. Brilliant outcome and got a good for Age in my category of 3:39:13 with an automatic place for 2018 to do it all over again . 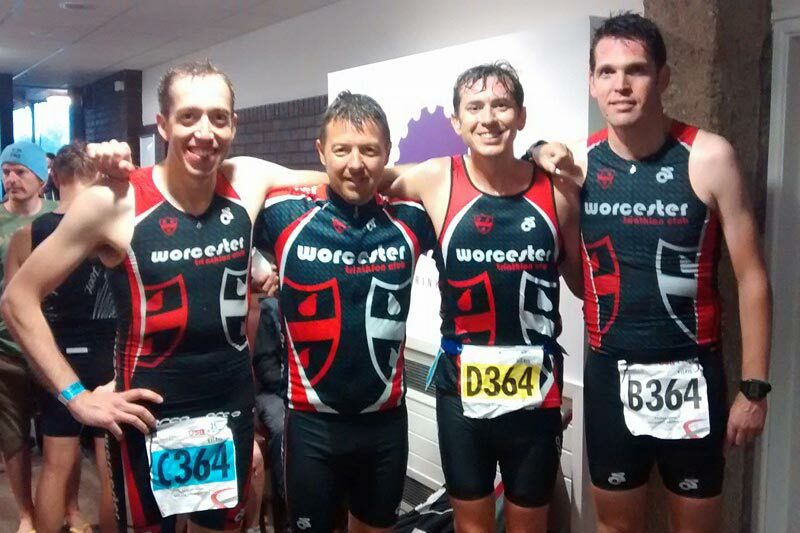 4th consecutive year as a Middle Distance age grouper and 2nd representing Worcester Tri Club. Following a week of heavy rain race day arrived with brilliant sunshine and great conditions for a race. Floating start in a causeway, followed by a slightly long swim and we were on our way and there is nothing like a foreign kit to fire up the competitive spirit in a Brit. The bike was typical undulating Scandinavian terrain, tight corners, wide open windy spaces, and loads of brits out on the course screaming their support. Back into town and on to a 4 lap run that of all things took us through a library on each loop to the obvious disinterest of everyone sat at a computer or reading a book !! !, only in Denmark J. Finished with a PB of 5:24.13 and as a result of finishing 2nd Brit and 10th in my age group got a pre qualifier for next year’s squad in October in Ibiza. The ‘old lady’ of Ironman 70.3 certainly said farewell with a memorable race on Sunday on Exmoor. All started well with a warm 19 degree lake, then followed a wet windy and greasy bike ride, ending with a ‘warmish’ offroad run. Brutal at times but great to be there to see Wimbleball say goodbye to the many Ironmen and Ironwomen who have taken it to there hearts a one of the toughest 70.3’s on the circuit. Despite being way short of a PB on any ‘normal’ course and finishing with a 3rd place podium for the 2nd time in its history I came away proud to have completed the day with everyone else who crossed its last finishing line.